Pancetta is Italian cured pork belly. I had looked into making it myself before, but the recipes I found required a curing chamber. A curing chamber is a cabinet with controlled temperature and humidity. Even for me it seems over the top to own one. But then I realised that pancetta was originally invented to preserve pork belly when refrigerators had not yet been invented (let alone curing chambers), so I figured that a cellar should do the trick as well. We don’t have a cellar, but in winter our garage comes pretty close with a temperature around 16ºC/60ºF. So I compared many recipes I found online on Italian blogs, on American blogs, and in the end based my first homemade pancetta upon a Dutch blog called missFromage (I bet Shanna likes that name!). Making your own pancetta is quite easy and not a lot of work, it just requires a bit of patience. The result was great! My first homemade pancetta has a more elegant and detailed flavor than store-bought pancetta available around here. As an added bonus it is cheaper as well. Thanks missFromage for making it look as easy as it actually is! I will definitely make this again. The start is always a nice piece of pork belly. 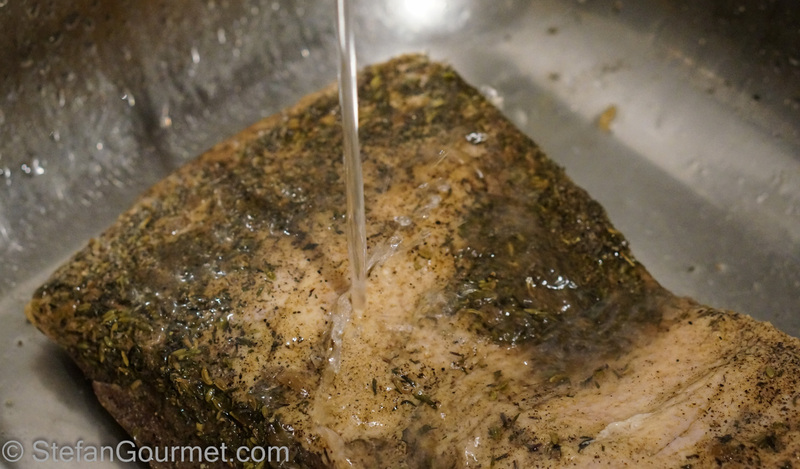 The first step is to salt the pork belly and refrigerate it for 7-10 days. There are many variations on the spices that are added to the salt for this process, and many variations on how to do this including putting the pancetta on an inclined surface so the juice flows down, using a ziploc bag and turning and massaging the pork belly on a daily basis, and putting a weight on top of the pork belly like when making gravlax. 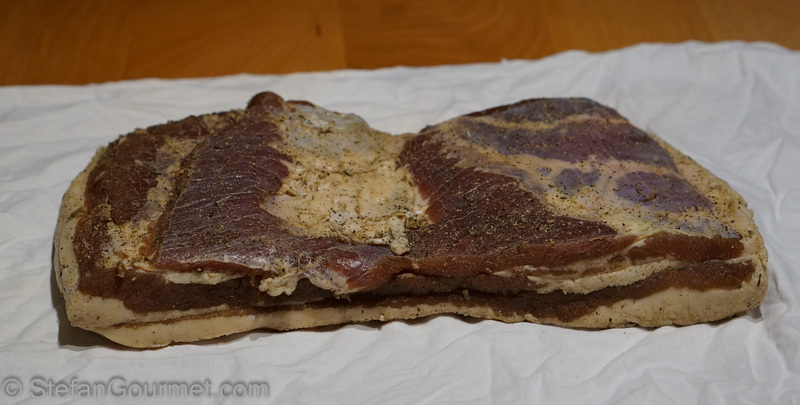 I decided to keep it simple and vacuum seal the pork belly with the salt and spice mix. Another decision to take here is whether to add nitrates at this point. Nitrite or nitrate (curing salt, pink salt, or saltpeter) are used to protect against botulism. Americans will probably decide to use it. The risk of botulism in an intact muscle like pork belly is very low, and in Europe it is not traditional to use it. Nitrates/nitrites change the color and the flavor of the pancetta. 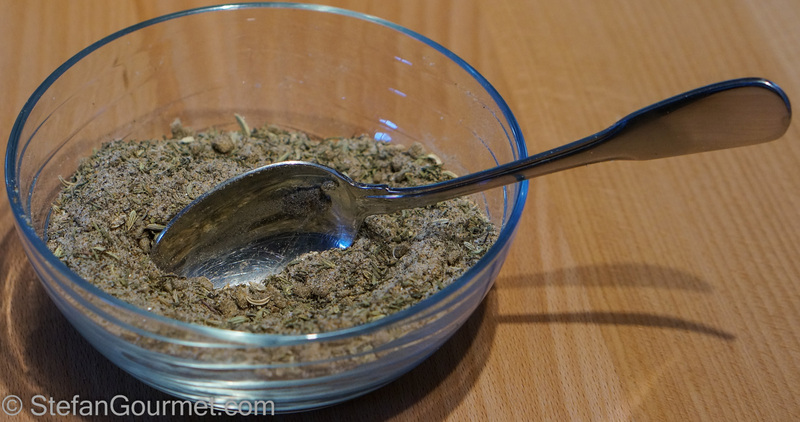 Combine the salt and spices in a bowl. Trim any loose pieces from the pork belly to make it even. 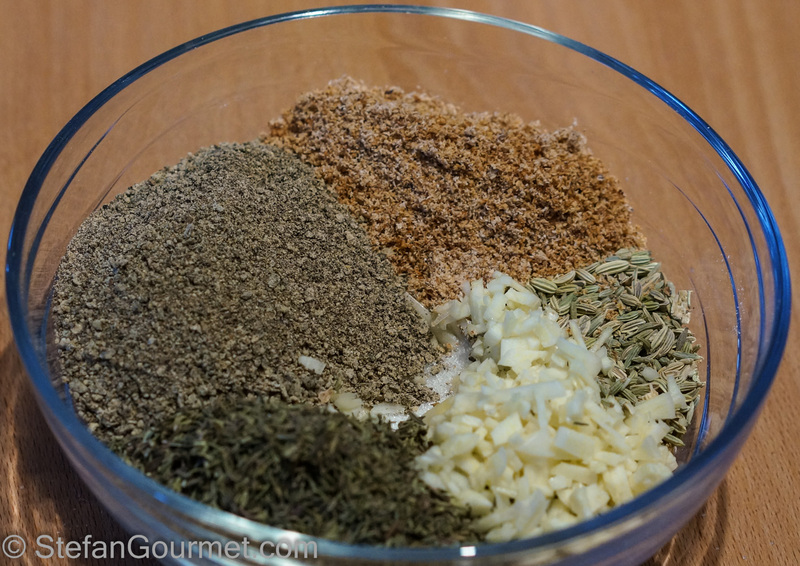 Rub the mixture on all sides of the piece of pork belly. Make sure it is covered everywhere, also in nooks and crannies. Vacuum seal, or put in a ziploc bag. Refrigerate for 7-10 days and turn over daily. After 7-10 days, the pork belly should feel hard and will have released some liquid. Take it out of the bag and rinse it under cold running water. 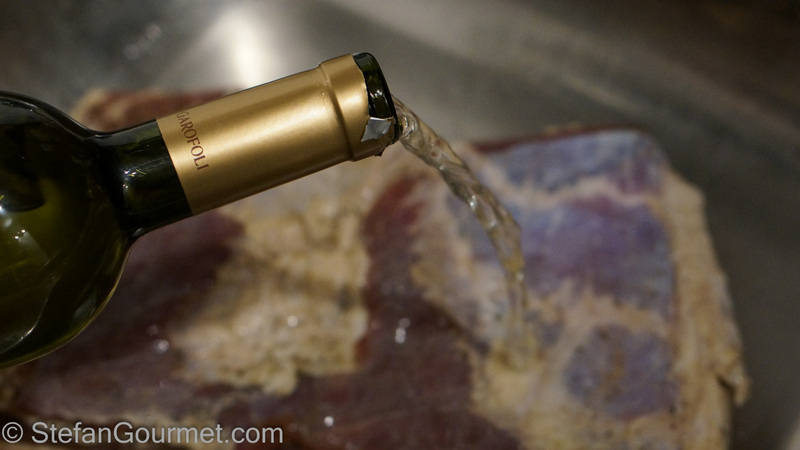 Wash the pancetta with white wine. This provides some flavor and also disinfects. Pat dry thoroughly with paper towels. Season the meat side with freshly ground black pepper. Find a clean piece of cloth that is big enough to wrap the pancetta. Wrap the pancetta in the cloth and secure with string. 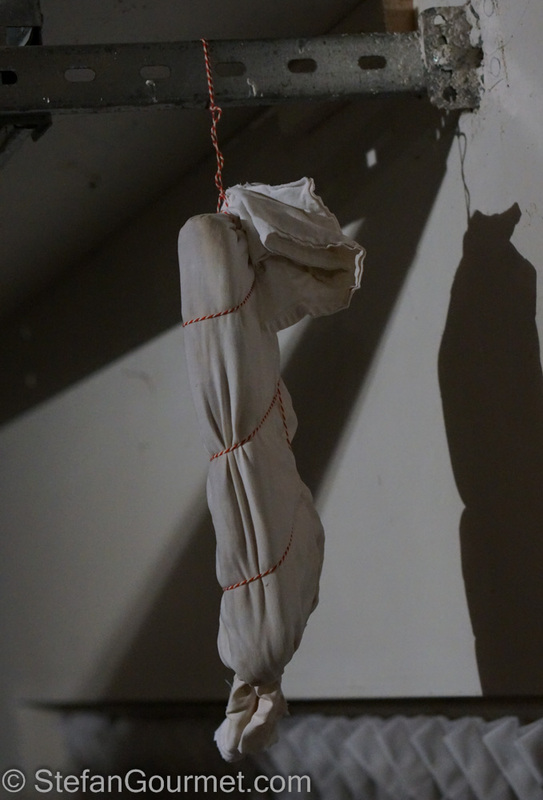 Hang the pancetta in a dark and cool place with some airflow (not drafty), preferably with relative humidity of around 60% and a temperature around 16ºC/60ºF. Wait at least one week for flat pancetta or two weeks for pancetta that has been rolled up. It is best to wait until the weight has been reduced to 66% of the original weight. Untie and unwrap the pancetta. It is now done! Wrap the pancetta in plastic and store in the refrigerator (for a few weeks) or freezer (for several months). It is best to eat it cooked, but according to some sources it can be eaten without cooking if it has been cured to a weight loss of at least 33%. 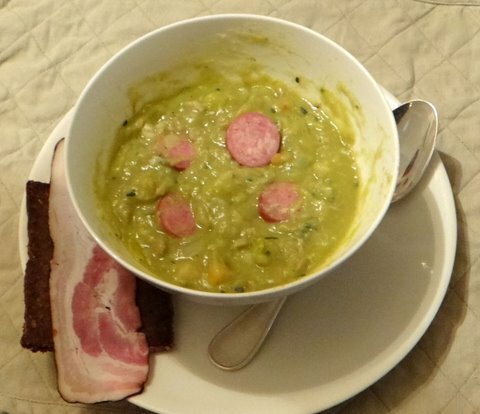 Two years ago I blogged about classic Dutch pea soup (erwtensoep or snert). Very tasty and very suitable for a cold winter day! Not bad! It doesn’t seem like much work at all! Is it much better than what you can buy at the store? And there it is sitting pretty on the board, as well! Wonderful! That depends a bit on which store-bought variety. It is definitely better than most of the stuff available around here, and even better than the one I get from an Italian deli. The flavor has more detail instead of being mostly salty. I was truly surprised at how easy it was to make this. 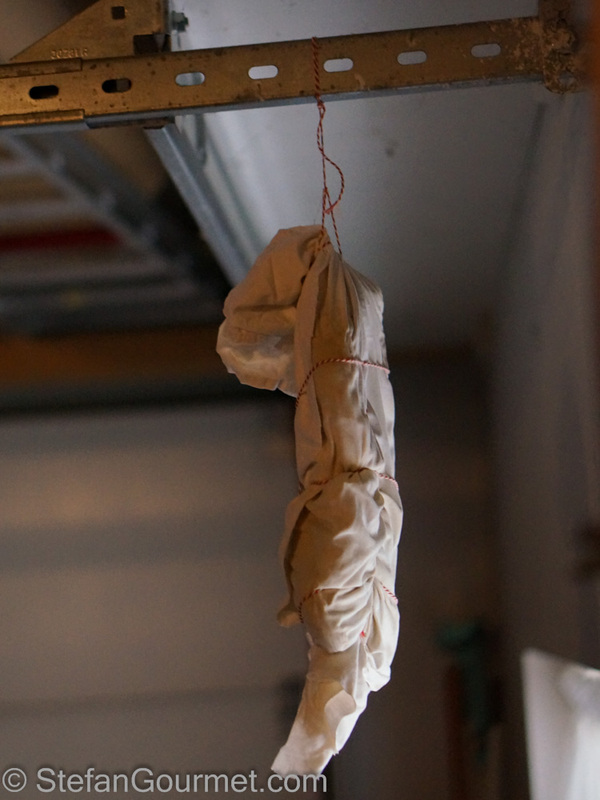 The hanging is what had me worried because I wasn’t sure whether it would work in my garage, but I shouldn’t have worried. Thanks for reminding me of Our Growing Edge. You had me at Pancetta! Thank you, Stefan!! I shall certainly try to make this come about June!! And in my garage!! Temps outside – 2 > 8 C in the mornings, never more than 16-18 C in daytime!! Sounds ideal and it would be quite a challenge!! Methinks I could ‘bring it in’ at about 1/4 shop price and very much healthier!!! Great, let me know how you like it! Grazie 🙂 Forse la prossima volta farò guanciale per fare un vero primo laziale. Yeah, Stefan, it’s looking great and yummie!! Good to hear you confirm how easy it is to make your own pancetta. Rubbing and drying, that’s it. Being patient is the hardest part, as I see it. The second time I made my pancetta, I told my butcher what my plans with the pork belly were. She was really enthousiastic and offered me a space in her smoking cabinet. After the spice bath in my fridge, I brought it back and a few days later I picked up my smoked pancetta. Not traditional, but very tasty! I will definitely experiment some more. 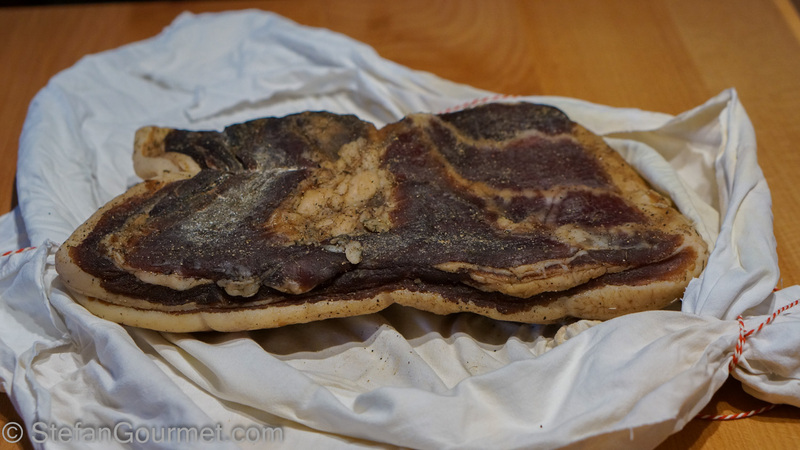 Perhaps my next experiment will be guanciale, as according to my Italian blogger friends that should really be used instead of pancetta for carbonara, amatriciana and gricia. Pancetta affumicata does exist in Italy, but it is not very common. I can imagine it was very tasty! Great Post Stefan…. and I have never heard of a curing chamber before. A cool, dry place with a bit of a draft is all you need. Keep an eye out for my post this friday about the Chinese equivalent! only now I’m catching up with your blog. Your post is so beautiful, and it does inspire me start curing meats again. It will be a while before I find a place that allows me to do so, I don’t think the cleaning crew would appreciate finding a piece of meat hanging in the closet here at the hotel… so once I move to a proper place, I will need either a garage or I might turn a wine cooler into a curing chamber which has been one my list of things to do for a very long time. Thanks Paul. You made me smile when I had a vision of dry curing in a hotel closet 🙂 Hope you will find a new place soon. 🙂 welcome! I saw some bison? recipe really quick, with eggplants… which looked amazing! I’m so behind! seriously, apologies! I’ll catch up! Take your time — you did miss quite some posts. I’m feeling that I am lagging behind over here. This is such a great post. Another detailed and excellent post. Good luck with your own guanciale experiment. Thanks!! will post how it goes! And dried loosing 33% to eat uncooked?is humidity too high. Hi Tim, I’m not sure what your question is exactly? Yes you do need to loose 33% of the fat to be able to eat it uncooked, and yes 82% relative humidity is a bit high, so it will take a long time to lose the 33%. 60-70% is better. You could reduce the relative humidity by slightly heating the cellar. You should. It is so much better than store-bought. I’ll make pancetta when I get back.